GEMS 6.4 delivers a world first, breakthrough block model conversion engine, enabling users to collaborate together using different software packages. The engine brings a new level of data sharing flexibility to the industry by providing direct conversion between different block model formats, delivering better collaboration and data integrity while saving users a great deal of time. 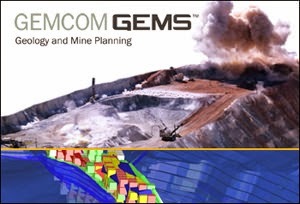 In addition to the patent-pending block model conversion engine, GEMS 6.4 provides powerful updates to existing functionality, as well as new features requested by users that increase productivity, including: enhanced block modelling capabilities; increased line, surface, and solid import and export options; and two point transformation profiles to transform solids and surfaces. The release is available free of charge as part of your Update Service and Technical Support (USTS) subscription. Import block model projects from external sources, including reblocking of sub blocked models. Work on tasks such as resource estimation in one package and provide them to another user in the format they use. Ensures data integrity is protected. Reduce workflow steps with the ability to choose multiple interpolation profiles at the same time, and view the number of profiles being referenced. Work with larger datasets and use more than 100 interpolation profiles with the interpolate and report feature. Modify a block model workspace by using a distance value to extend or shrink the block model dimensions. Save many more interpolated values into block model destination workspaces with improved block model saving capabilities. Additional attributes are imported and populated when users import pits from Whittle Mining Sequence (.msq) files. Geospatial filtering is now possible through the use of clipping boundaries when importing points and lines. Enhanced importing capabilities support Optech 3D rings (.xyz files), and Leapfrog mesh files. Esri shapefiles can be imported as points, polylines, or polygons. Expanded functionality for importing and exporting Surpac string files. Import Surpac digital terrain model files as surfaces or solids. New two point transformation profile can be used to transform the coordinates of solids and surfaces from one system to another. Improved sorting capabilities in GEMS’ Production Scheduler allow for more efficient scheduling. Users can see the number of available seats for a network license and the list of users using the licenses. Multiple tokens on a single seat are now supported for roaming and standalone license users.